My daughter is 3!!! where did that come from??? While I am aware that time flies – also learning to cherish every moment and season for what it is! it still does not change the madness of the reality of how quickly it’s all going. Her heart is warm, I feel it in her relationship with a little brother. It is filled with love to give. Without question her confidence and defiance is also growing. she is not afraid to use the N word (NO) or push her plate away if she is not impressed with Mummy or Daddy’s cooking. She is however developing those melt you with your eyes, smile and “please Daddy” strings to her bow. With anyone, she can hook you round her little finger but I’m still holding strong. Maya started nursery a couple of weeks ago. We have made life choices that have enabled us to send her when we thought she (and us) were ready. I drop her off the 2 mornings she is in each week. The nursery is based on the same site as a primary school. We have to go through the school playground to get inside. She holds my hand as we come up to a group of boys probably 8-9 years old. She says “Daddy I don’t like boys”. Of course a huge grin comes across my face. I simply say “don’t worry darling Daddy’s here. Let’s go” and we walk past. We enter the nursery and head over to her peg where she takes off her jacket, puts on her slippers and puts her lunch bag (a snazzy black and purple polka dotted number) on the trolly. Her key worker Miss Anna (who is lovely) approaches us. “It’s time for Daddy to go. I say “ok Maya it’s time to go, Daddy has work now”. “Ok Daddy” she replies staying by my side. I crouch down “ok darling you gonna go in and play with some toys now?” “Ok Daddy” is the response still glued to my side. Ms Anna draws closer says “Hi Maya how are you today? Should we find your name and put it on your tray?” She takes Ms Anna’s hand says ok and walks into the room. 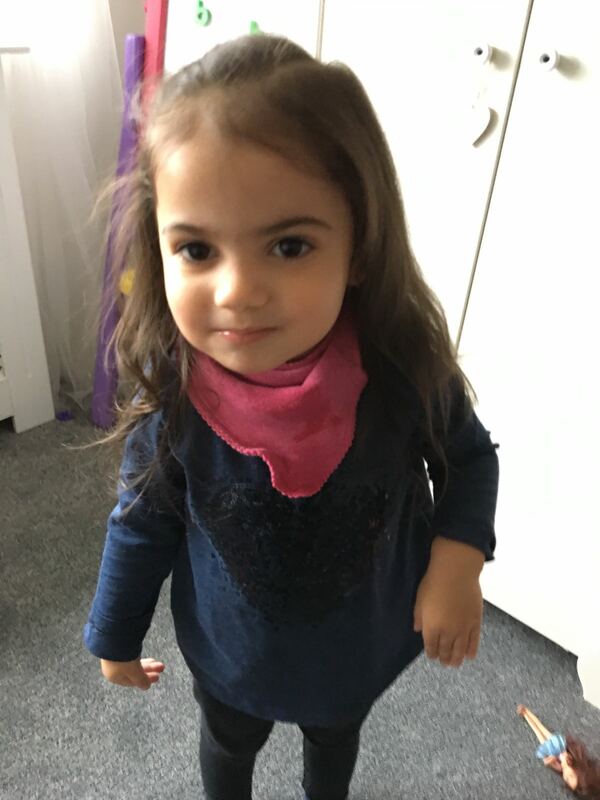 “You going to say bye to daddy?” prompts Ms Anna and she comes back and gives me a hug, kiss and says “bye daddy love you lots” and off she goes. I would be lying if I said it didn’t feel the emotion at that moment of letting my baby girl go. Not leaving her with family or friends but a load of strangers for the morning. Thankfully there were no tears and thankfully she is taking to nursery well, as she should she is more than ready for it. And so the process of saying goodbye and letting go has begun. Of course I’ll always be her Dad but I won’t always physically be there. I was told by a wise old dear “They are gifts to look after but not to keep”. I see the truth in that statement, she isn’t mine at all. It’s still tough though. Letting go, even if it is for 4 hours. I’m not convinced it will get easier trusting her to the world but my faith and the pictures that I see on the nursery website tell me that my baby girl is gonna do just fine.